We don’t always need to build. “I was the subprime,” states André Albuquerque over dinner in a dimly lit late-night restaurant in Lisbon, Portugal, whose decor is a little too reminiscent of the 1970s. The 33-year-old architect is referring to the economic crisis in neighbouring Spain, and particularly the residential real-estate bubble that saw prices in the country rise 200 per cent from 1996 to 2007. For a good part of the early 2000s, Albuquerque worked in Madrid as part of a large-scale architecture studio, designing condos that would never be inhabited, vast expanses of concrete built upon fertileland in suburbs that would remain empty. By the time the crisis hit in 2008, the architect had become frustrated and disillusioned with the discipline, and was looking for alternatives. In 2012 he returned to Lisbon, his hometown, and co-founded Polígono (Polygon), an architecture firm that operates with a multifaceted, small-scale, self-build, politicised approach. Albuquerque is not alone. In the last two years, the country has seen a rise in the number of small studios seeking alternatives to Portugal’s prevalent and crystallised outlook on architecture. The economic growth of the ’80s, mainly fuelled by European funds that poured into the country following Portugal’s entry into the EU in 1986, was the engine behind a massive building boom throughout the country, giving architects a chanceto enter the spotlight. When the ’90s brought international recognition to architects such as Álvaro Siza and Eduardo Souto de Moura, a vast array of practitioners began to engage aesthetics and processes that emulated those of the masters, creating a codified, powerful and self-referential professional elite that, to this day, holds the keys to most architectural production and teaching. 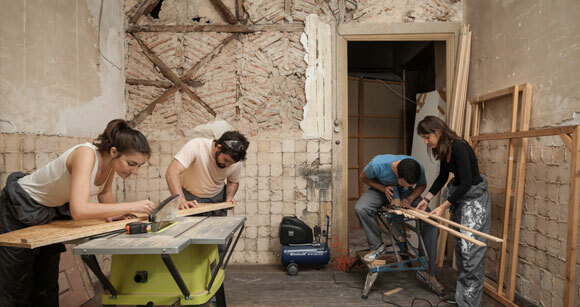 “We were educated to believe we would design a radiant future,” state architects Ana Jara and Lucinda Correia, co-founders of the recently formed Artéria (Artery) studio, which is principally focused on small-scale, multidisciplinary rehabilitation projects in Lisbon’s central, dilapidated historic neighbourhoods. “Instead, we find ourselves fighting against the extreme individualism we’ve arrived to as architects. The context we findourselves in isn’t a war like World War II, but it is nonetheless a war, because all of our expectations have been betrayed.” Both in their early thirties, Jara and Correia are seeking to change the architect’s role, embracing a transversal function of mediator and defying short-term memory in a country that, in the ’80s, preferred to tear down and build from scratch rather than recognise the value in previous architectural achievements.Following external market pressure, Portugal officially requested a bailout in April 2011, and by early May a 78-billion euro IMF-EU rescue package had been agreed. The year closed with a 13.8 per cent unemployment rate, 20 per cent of which were aged under 25, and the government acknowledgedthe existence of a new migratory wave directed towards Switzerland, France, Angola and Brazil. The architectural class proclaimed there was “no work”, and even the upper echelons of government encouraged Portuguese youths to leave the country in search of brighter opportunities. “Even school is made that way,” says Tiago Mota Saraiva, co-founder of architecture studio ateliermob, pointing out how Portuguesearchitects are consistently encouraged to abandon the country. “Before the crisis, not going out of the country to work was considered a failure, and now it seems the opposite is true.” From 2005 to 2008, Mota Saraiva was running ateliermob like any other architecture studio—entering standard competitions mostly abroad, winning some and losing some. “In 2008, with the crisis, we had to drastically change the way we worked,” he states. “We started working much more in Portugal.” The 37-year-old architect believes there is plenty of work to be done by architects in the country, and lack of funding doesn’t mean lack of opportunity. “The architect’s role in this moment is essential, and to let go of it is to deface the meaning of ourprofession. We don’t always need to build.” Mota Saraiva’s ateliermob is seen by many young emerging studios as a point of reference. Reinventing itself, the Lisbon-based practice adapted to the country’s current crisis context, engaging in small-scale urban intervention projects thatconnect different agents in the urban and political fabric. Their Working with the 99% project, which maps and rehabilitates two self-built neighbourhoods in the Lisbon periphery in a joint effort with the inhabitants, was distinguished at the 2012 Venice Architecture Biennale with the Future Cities Award. The markedly politicised and vocal Mota Saraiva, who also pens a weekly newspaper column, makes a point of getting involvedin as many projects as possible, serving as living proof that the crisis is filled with opportunities. Other initiatives, such as last year’s European Capital of Culture in the northern Portuguese town of Guimarães, encouraged other kinds of architectural forays, from temporary occupations of public space, to humorous interventions that subverted theuse of public infrastructure. A series of curious “public pools” were installed in several city fountains by Porto-based studio LIKEarchitects, in their characteristic ready-made, subversive style. A young studio that has gained notoriety in the past two years, LIKE work mainly with pre-existing objects—from ikea lamps to plastic fruit crates—which they treat as modules, repeating them in intricate concoctions that become instant visual hits. Their formalist appeal has turned them into one of the few studios that succeed in working simultaneously with clients as diverse as an art biennial and a major telecommunications company.